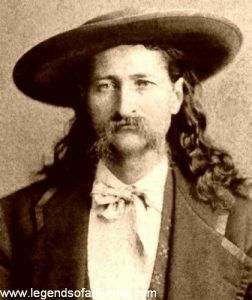 Bill Hickok-David Tutt Shootout (1865) – In July of 1865 Hickok met up with a twenty-six-year-old gambler in Springfield, Missouri, to whom Hickok lost at the gaming tables. When Bill couldn’t pay up, Dave Tutt took Hickok’s gold pocket watch for security. Hickok growled that if Tutt so much as used the timepiece, he would kill him. However, on July 21, 1865, the two met in the public square and Tutt was proudly wearing the watch for all to see. This insult, of course, soon led to a gunfight. At a distance of about 75 yards, the two faced off. Tutt’s shot missed but Hickok’s hit Tutt in the chest. The wounded man then stumbled for about twenty feet before he finally fell to the ground dead. Two days later, Hickok was arrested and tried for manslaughter. His trial began on August 3rd, in which Hickok claimed self-defense. Three days later, he was acquitted of all charges. Dave Tutt’s body was buried in the Springfield City Cemetery, but was later moved to the Maple Park Cemetery, where it is today. The site is marked with a gravestone showing a carved pocket watch, playing cards and pistols.